It’s November and I am thankful for many many things, but especially fresh cranberries! I buy several bags of them to make into Fresh and Raw Cranberry Relish, chutney or jam, and to freeze so they can be enjoyed long after their fresh season has ended. 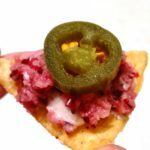 After whipping up 2017’s first batch of relish a few days ago, I had a flash inspiration for an appetizer that was a major hit in my kitchen, and with my new book group pals! By popular request, here is the recipe for you all. Place goat cheese log in the middle of serving platter. Arrange the relish along one side of log and chips along the other side. Side dress the platter with pickled jalapeno slices. To devour, smear a bit of goat cheese onto a chip. Top with relish, followed by a jalapeno slice. Pop the whole thing into your mouth and crunch with delight. Repeat. And you’ll probably want to repeat again and again. 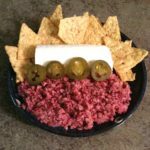 The contrasting yet complementary textures and flavors of this appetizer are very tasty…and addictive. My mouth is watering just thinking about eating these tonight. Thanks for the recipe. I can tell my first attempt didn’t work quite right, but it was my introduction to using a food processor. You are most welcome, Dawn! Hmmm, what do you feel didn’t work? Perhaps I can advise.